I Adam and Eve you'll like this Captain Hook! Even the most dedicated fans of British TV programs must frequently scratch their heads at some of the more colorful and peculiar (to American ears, anyway!) terms that they encounter when simply trying to watch Downton Abbey, Dr. Who or anything involving Russell Brand. 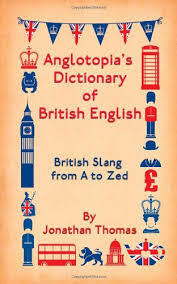 Luckily Jonathan Thomas from the outstanding site Anglotopia.net has come to rescue with his handy and informative book Anglotopia's Dictionary of British English: British Slang from A to Zed. Now you can nod appreciatively rather than recoiling in horror when any British people of your acquaintance talk about eating courgettes or sarnies. You'll also know whether to slap or hug the person who calls you a pikey, chav, plonker or minger (hint: I think it's slaps all round!). The book is divided in to sections that help you narrow down even further which type of British slang is involved. As well as an extensive general dictionary, there are also sections on London, Cockney, Scottish, West Country, Yorkshire, and Scouse slang, as well as the indispensable chapter on insults. There's also a section on Australian slang, in which words that mean one thing to British or American readers have a different meaning down in Oz! It's quite fascinating to read all the examples of where our supposedly common tongue veer off into strange directions. The author explains how countless hours of research went into compiling the various lists in the book, and how he made it a practice to jot down unfamiliar words while watching British TV programs. I really need to do that, because it might help me cement some of these words in my memory. I can't count the number of times I've had to look up the word "bespoke," which appears quite frequently in British books and TV shows, but rarely over here. For those who don't know, the Anglotopia website is chock full of interesting and relevant information for those of us who love all things British. It would be funny to see the counterpart of this book, to see what American terms flummox our British friends, and to read the definitions of those words from a British point of view. This is really a fascinating book that I'm sure will be really useful during my next British TV binge. I'll be sure to keep that pencil handy, though, because there is a form in the back for readers to send in suggestions for inclusion in the next edition of the book. Drat! They've already got "bespoke" but at least now I'll have a handy way to look it up the next time I encounter it! Please visit the official site for the book for much more information! Disclaimer: I received a copy of Anglotopia's Dictionary of British English from the author in exchange for this review.